After a period of forced exile and solitary wandering brought about by his radical views on religion and politics, Jean-Jacques Rousseau returned to Paris in 1770. Here, in the last two years of his life, he wrote his final work, the Reveries. In this eloquent masterpiece the great political thinker describes his sense of isolation from a society he felt had rejected his writings - and the manner in which he has come to terms with his alienation, as he walks around Paris, gazing at plants, day-dreaming and finding comfort in the virtues of solitude and the natural world. 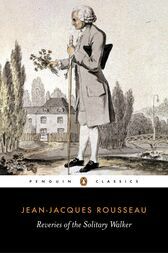 Meditative, amusing and lyrical, this is a fascinating exploration of Rousseau's thought as he looks back over his life, searching to justify his actions, to defend himself against his critics and to elaborate upon his philosophy. Jean-Jacques Rousseau was born in Geneva in 1712. Abandoned by his father at the age of ten, he left the city in 1728 and from then on wandered Europe, searching for happiness. In 1732 he settled for eight years at Les Charmettes, remembered in his book Confessions. In 1741 he moved to Paris where he met Diderot, in the meantime fathering five children, all of whom he abandoned. His corwning achievement is his work of political philosophy, The Social Contract, which was published in 1762. He died in 1778. Peter France is the author of books on French and Russian literature and has translated widely from both languages.